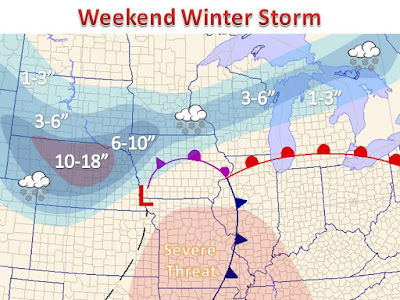 Another winter storm is poised to move towards the Midwest by the weekend. Rain will develop late Friday night across the Plains and begin to changeover to mainly snow through the day on Saturday. 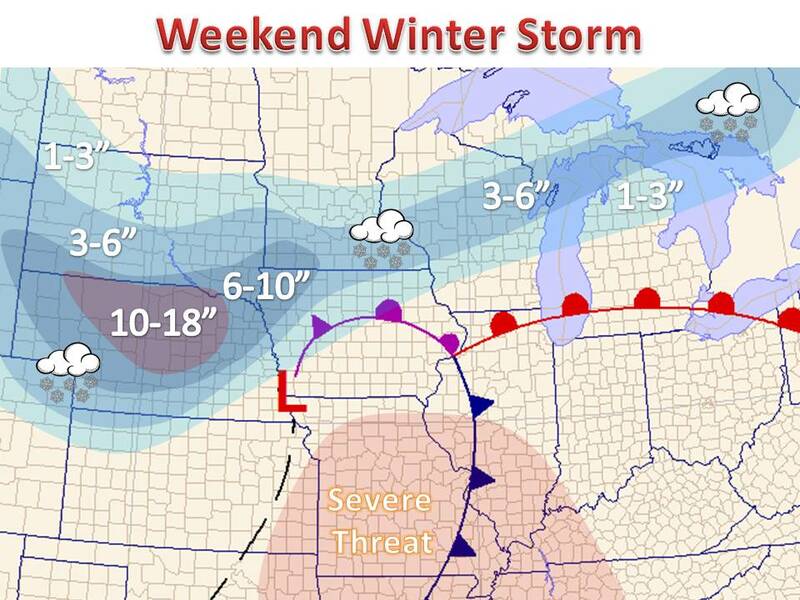 Snow will eventually spread north and east into the Upper Midwest late in the day Saturday. Some of the precipitation will begin as a light wintry mix of freezing rain and sleet, but will change over to all snow through a lifting mechanism that will act to cool the layer. The area of heaviest snow will be localized across Nebraska, with lesser amounts outward from there. The lack of a large swath of heavier snow has to do with the life stage of the low pressure system. In many cases storms emerge from the Rockies and develop from that point forward. With similar systems across this part of the world, the life stage of strongest precipitation usually last 1-3 days. However, the weekend winter storm developed on the west coast and dumped heavy rain and snow across the Southwest Thursday. Being in its mature stage, the area of snow will quickly develop Saturday, then quickly fall apart Saturday into Sunday. 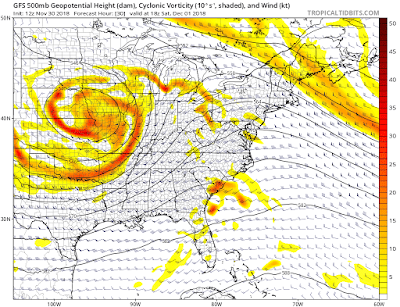 It can also be seen in a 500mb chart below, where the closed upper low is a sign of future weakening, as the system become occluded. Nonetheless, a band of snow is expected to sit and pivot over Nebraska, where many will see over a foot of snow by Sunday. Areas further south across the Mid-Lower Mississippi River Valley will see severe weather Friday and Saturday, as the cold front provides a mechanism for lift in an unstable environment. 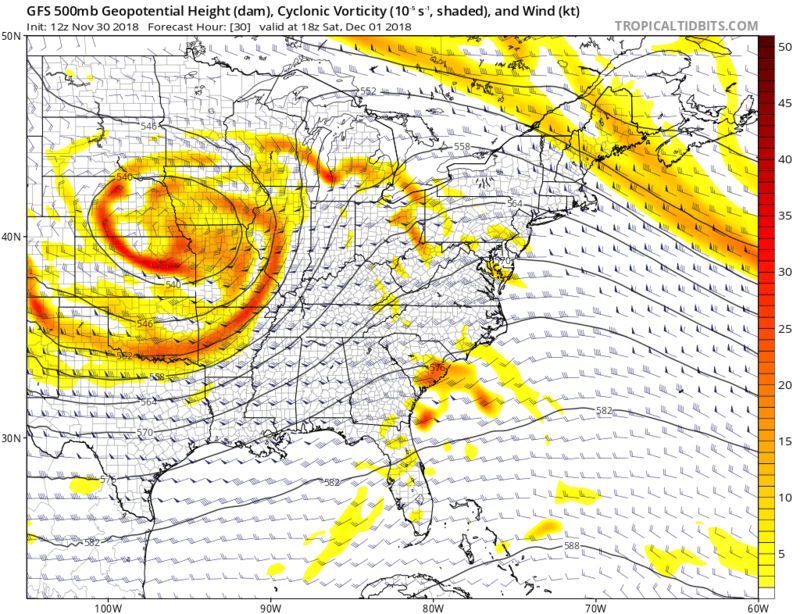 Isolated tornadoes are possible, with an upper jet superimposed over the same locations, providing turning with height for tornadic thunderstorms. As always, be sure to follow on Twitter for more updates and weather content.